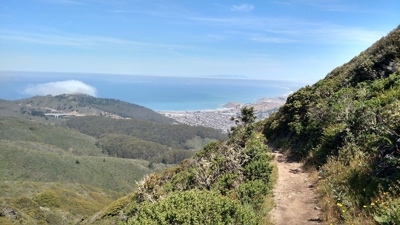 For the willing hiker, Mount Montara offers breathtaking views of Half Moon Bay’s mountains and its iconic ocean surf receding into the horizon. On a clear day, it is one of the great hikes in the Bay region. On any day, landing at the Moss Beach Distillery offers an earned repose from the 6.4 mile loop and 1,725 foot ascent to the summit. This hike is moderately challenging, with a 10% grade over much of the climb.